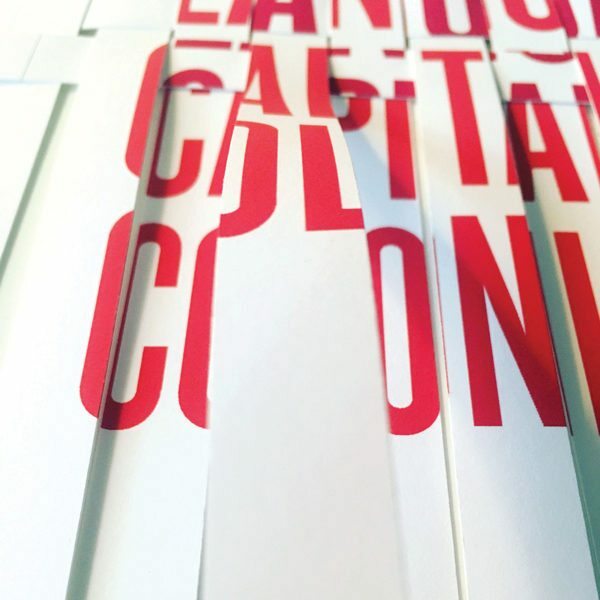 Toronto Book designer Ingrid Paulson took on a complex design challenge and topic with her cover for Language, Capitalism, Colonialism: Toward a Critical History, a survey that links language to social inequalities, publishing in November with University of Toronto Press’s Higher Education Division. “They didn’t know what to do with it; I didn’t know what to do with it,” says Paulson. In the design brief, UTP suggested an all-type cover that would reflect the idea of production and incorporate the colour red, which appears through the book by anthropology professors Monica Heller and Bonnie McElhinny. Paulson thought about a woven motif, given that the colonial period covered often involved the exchange of cotton for milling cloth to be used for weaving. She also imagined that the design could act as a nod to the history of handcrafted baskets that were used for carrying goods in many colonialized regions of Africa and South America. Paulson, who had some previous experience incorporating paper-crafting into cover concepts, printed out two copies of her proposed design, cut them into equal strips, and, using tape, physically wove them together on her large desk. UTP loved the concept, but found the initial colour combination of red, white, and blue too busy. So Paulson eliminated the blue, tinkered around to get the perfect red, and began weaving the paper again.